"Alambe" is a Konkani name for mushroom and Gud gud alambe aka thunder mushrooms are tiny wild produce, which grow in certain places of Karnataka. 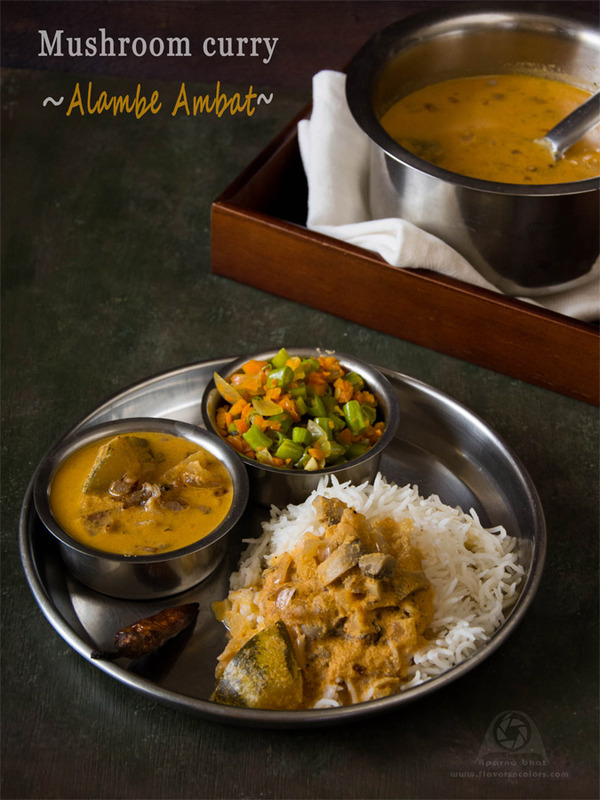 There was this moment my palate was yearning for Konkani delicacies prepared from "Gud gud alambe" after knowing about monsoon arrival in Karnataka. These wild fungi sprout at the onset of monsoon when there is thundering and lightning [gud gud in konkani] and thus you get to indulge in the seasonal delicacy for a limited time only. Quite expensive but that doesn't deter Amchis (Konkani people) from buying it and relishing the dishes such as alambe bhutti, alambe song, alambe ambat .. Sigh! With no chance to lay my hands on these wild mushrooms and India vacation still a month away, I had to settle down with the availability of the white mushrooms here and satiate my cravings by preparing this tasty Magge Alambe ambat. We all enjoyed the curry with steaming hot rice. Wash the mangalore cucumber, do not remove the skin. De-seed and chop into 1 inch size pieces. Cook the chopped chunks of mangalore cucumber with little water . Once the cucumber chunks are half done add mushroom bits, finely chopped onion in a vessel and continue cooking until done. Switch off the flame and cover the vessel with lid. You may choose to cook all the vegetables with salt and water together in a pressure cooker also, but take care not to overcook mangalore cucumber. Meanwhile prepare the masala. Roast red chillies in few drops of oil. Grind roasted red chillies, grated coconut and tamarind to a fine paste. Add the masala to the cooked veggies, salt as per the taste and mix well. Adjust the consistency of the curry by adding some water if you prefer it to be not thick. Bring the curry to a boil. Finally prepare the seasoning. Heat coconut oil in small pan and add finely chopped onions. Keep stirring until the onions turn brown. Pour it on the curry and switch off the flame. Cover the vessel with lid. Let it sit for some time before you serve. Serve it with steaming hot rice or phulkas. This curry tastes better the next day as the ingredients blend in well and seep out their flavors. 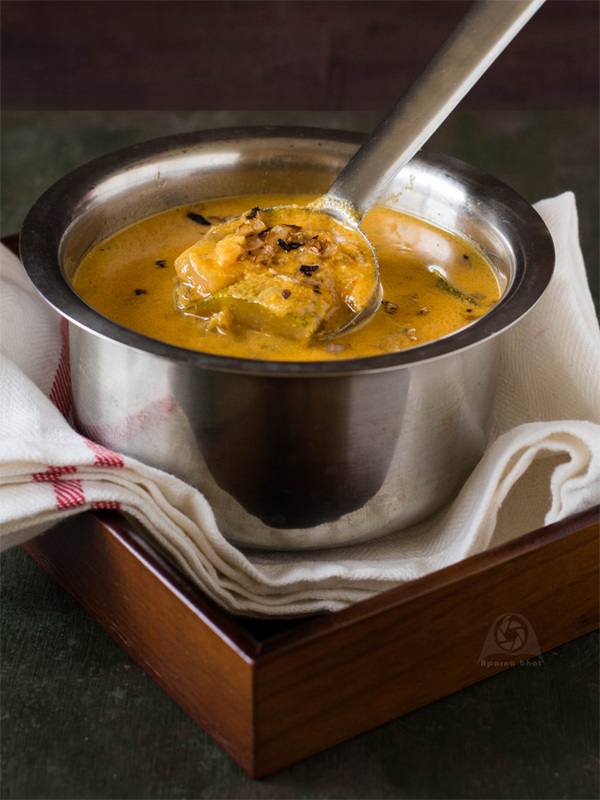 We do not use dal in this recipe the way we do in other ambat recipes.